Why Choose St. Louis Vein & Endovascular? Experienced and trusted. Our company practices minimally invasive, comprehensive evaluation and treatment for venous and endovascular conditions throughout the body. Dr. Krikorian is the owner and Medical Director of St. Louis Vein & Endovascular. It is his main goal to offer only up-to-date, specialized vein care for his Missouri and Illinois patients. As a leading cardiologist in the Missouri area for the past 15 years, Dr. Krikorian has the experience and credentials to insure you receive top quality treatment. Whether you’re struggling with the cosmetic affects of spider veins, or the aching in your legs from varicose veins, we have treatment options for you. Dr. Krikorian has the knowledge and experience to help your legs look and feel their best. Treatments include, Ambulatory Phlebectomy, Endovenous Laser Ablation (EVLT), Radiofrequency (RF) Ablation, and Ultrasound Guided Sclerotherapy. Dr. Raffi Krikorian, MD, FACC, RVT, RPVI strives to help you get back into your active lifestyle–and those summer shorts. Here at St. Louis Vein & Endovascular we offer a variety of vein treatments to restore your legs, and there has never been a better time to start. Dr. Krikorian provides each patient with specialized care to accurately treat your unique venous insufficiency; from your initial consultation to the final stages of treatment. • Individualized care from a board certified physician with nearly 20 years of experience. • Cutting-edge diagnostic techniques including ultrasound, CT and MRI. 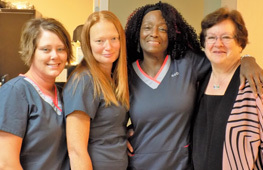 • A caring staff that is dedicated to making your experience as easy and comfortable as possible. 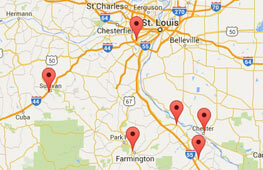 Schedule a consultation at one of our convenient locations in St. Louis. At St. Louis Vein & Endovascular we specialize in listening to and solving the unique vein problems of our patients. We have expertise in modern, advanced non-invasive techniques in varicose and spider vein treatment. In our practice, each staff member strives to successfully meet the ever-changing individual health needs of our patients. Copyright © 2019 St. Louis Vein & Endovascular. All rights reserved.